Ad-manum is one of the biggest manufacturers of pp / hdpe woven sacks in central india. The pp / hdpe woven sacks are manufactured for various applications like packing of cement, fertilizers, chemicals, foodgrains, etc. We engage in manufacturing, supplying, and exporting a quality assortment of Laminated PP and HDPE Woven Sacks to our invaluable clients. We are engaged in manufacturing and supplying a quality range of PP/HDPE Woven Sacks. These woven sacks are used to pack particle size products in the most efficient manner. We offer our range with liner in order to ensure extra protection to fine material. Developed using high-grade HDPE and PP material, the usage of these products ensure zero leakage. - Packing of Fine chemicals, sugar, fertilizers etc. 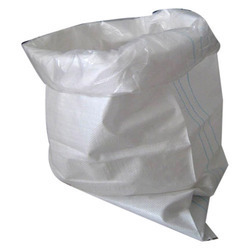 Plain Weave Bags which is use in bulk Packaging & small packing application of Product is packing of Cement bags, Fertilizers, Chemicals, Salt, Minerals, Grain, etc.